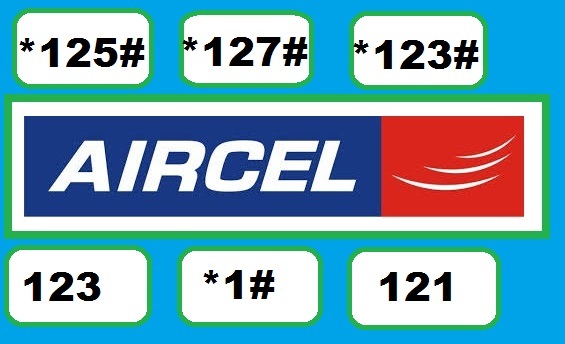 Aircel all USSD codes to check balance, offer, plan, alert, etc. USSD is an acronym of Unstructured Supplementary Service Data, is a protocol. Aircel is one of an Indian Mobile telecom operator, which offers voice and data services ranging from prepaid and postpaid plans, Broadband wireless Service, 2G, 3G and Value added Services(VAS). This post will give you all USSD codes and also the way to get SMS alerts, to find balance, offer, plan and alert of Aircel. You can also see for Apn setting of Aircel if you are facing problem in setting APN in android mobile and access to internet. Here are the list of codes. Note: All codes are tested and are working in Delhi NCR zone. There may be some chances that USSD code listed below may not work at your state. (If you know the USSD code, then your comment is always welcome). We ensure you, to keep all the codes updated through time. all Aircel message and call services and Port Number, which allow you to switch from one network service provider to other without changing your number. Do comment below if you are unanswered from the above post or comment below your experience of using Aircel USSD code services. Sir, I have Google Samsung Nexus S model I9023 and I have problem with sim card. My phone shows No Sim Card. But when I replaced the sim with other phone,it works properly. Kindly help me to solve this problem. Thanks Abhishek for the valuable information. Sir, I have recharged for a data package, but it has been expired now. When I topup, my talk time balance gets deducted for that pack. How can I deactivate it? To know about the GPRS balance!!!!!!!!!!! Sir how can i chek my best offer in west bengal aircel prepaid sim card ?? Thanks.. codes worked properly to find balance. My aircel rajasthan number is 8387983912 which i m using in pachmarhi, madhya pradesh. I have recharge my number for Rs29 for 200mb data for seven days but still balance talktime is being deducted for using internet . Pls tell me about this as early as possible. Because it is on roaming…… Lakhsmikant!! A roaming pack will solve the problem! A roaming pack is never required for your net pack. I have been using my reliance Odisha sim in Maharashtra for Internet use. As there is no reliance 3G in pune I manually select TATA DOCOMO MAHARASHTRA. Still no balance deductions. And in places where there is Reliance 3G too.. There is no problem using roaming net. You should active data roaming facility from Setting menu of your mobile. No issue whether you are in roaming or in your own circle, there will be no extra deduction for the data usage apart from your data pack. Sir when I dailed any USSD code my phone shows unknown application. I want to know the bal data and validity of rs 198 mobile data pack. I HAVE RECHARGED 109 , I SHOULD GET 130 TT AND 130 MB NET FOR 30 DAYS. BUT I CANT CHECK THE SPCIAL A/C. TELL THE USSD. I have checked with *126*1# but it shows unknown application pls let me know how can i check free left out data through USSD for aircel in Tamilnadu. How can check the aircel service status? I have checked with *126*1# but it shows unknown application pls let me know how can i check free left out data through USSD for aircel. I purchase new sim aircer RC 175 .I dont not receive net balance 250 mb on right time.net speed too slow. Ussd code for 3Gnet balance enquiry is not working (in bhubaneswar) pls send the correct code. Then enter 1 to check balance. Here you can also check promotional balance for voice, sms & internet data. To know your own number, dail *133# & enter 2. USSD code for deactivating PI 2 ? Type SPICE or ANDROID TO 121 and you will get 500mb every month for three month for free. I am using Aircel 3G in Kolkata. I have 370 MB data, but when I am trying to connect to the internet, it is deducting balance from my main account. What to do? My aircel number . I have recharge my number for Rs98 for 1GB data for 21 days but still balance talktime is being deducted for using internet . Pls tell me about this as early as possible. I just use this aircel for internet and i never do simple recharges ..juat some days in a month bit it says your jkrs2 has renewed …and cuts my balance ..n costomer care never takes up ma phone plz help me how to stop this service i tried 155223 but it says no vas service activated plz help…..
how to check own mobile number special offer? I have aircel 3G rs.599 data plan on my phone which gives 6 GB data for 3 months. Will it give full 6 gb data at the beginning or at 2 gb per month? ? aircel number check is not working.please provide right code for odisha circle. This is the balance check ussd code and also sms balance check. I hv recharge aircel 3G data rs. 275.but I check data Balance. What is USSD code of aircel 2 aircel free calls…….? how to check last three recharges? For checking aircel 2G net balance between Kolkata. Just dial *401#.somebody help me to give aircel 3G net balance check code. I have the recharge of rs 209 to get 260 but now how I can check the balance in the main account? Dial *143*0# to check 3G balance and *400# to check 2G balance in Aircel Kolkata. How to check 2G balance in Tripura? I am not getting flash messege when I switch off my data of how much data I have used just before and how much data is left. Please start this service in my mobile. I have recharged for 28 in aircel for 2g 110 mb.But I can’t check my data balance. Please suggest ussd code . I want recharge my aircel net pack from my main balance for 148 is there any USSD method or SMS or ivr to activate the pack . when ussd code *121*011# gets activated ?? i want to know that how to check aircel 299 from castomar care and they send me a massage to check this *143*0299#. bt when i use it show me connection problem or invalid MMI code. so plz tell me how to check it.. I want to knw my tariff or current plan. What ussd i shud dial to knw tariff. hello i can’t check my internet balance the above all numbers i checked but shown unknown application ,invalid mmi no or incorrect number.so how i know the net balance pls reply asap. How to deactivate *123# services! if possible please stop the services from your end. Sir, I belong to Kolkata, I have bought a new Aircel SIM Card , but I don’t know how to check the free minutes , so please inform me. I was recharged my Aircel Kolkata no with spl offer 109 which have to give me 130 DA Talktime balance and 130 mb net. How do I checked those balance and validity? Please help. Tell me the ussd code. I was recharged my Aircel rajasthan no with spl offer 291 which have to give me 90000 local and national seconds, local A 2A free and 500 mb net. Bt I couldn’t check my remaining minutes…. How do I checked it….. I was try every ussd codes which u Gave above…… Please help. Tell me the ussd code. how to check data balance when i have recharged with rs 28.? i am from west bengal. I’m from Kerala…….how to activate RC 59?? I want to check the minutes I have..i got a voucher pack recharge on my number.. what code should I use? Good. It worked. I am able to check balance with USSD code. How can I check my offer for my aircel no? Please send the desired ussd code. i rechaged wd 75 for 175 min local and std .. how to know min balance? *111*9# this code not working. pleas give me right code namber. pleas tell me my net balace this number. Now i recharge with 35 rupees for ratcutter 10p/s for all mobile SIMS 30 days.but still now aircel deduct my main balance by not respect to the ratecutter. So how do i check my rate cutter availability in my phone. Tell me the code…..Pls REPLY…..? Sir, How to check my internet pack on samsung galaxy J7 please help me sir…..
i recharge special offer 196 for 4gb data net offer for 60 days validity. bt i dont show data balance what i do ??? what is the perfect code for check this data balance ?? ?